Critically Ill Children Who Received Wishes Cut Their Health Care Costs : Shots - Health News Although researchers acknowledge that many factors could be at play, a recent study suggests that seriously ill children who had once-in-a-lifetime wishes fulfilled also had lower health care costs. While recovering from treatment for aplastic anemia, Tiffany Rowe had her wish granted. 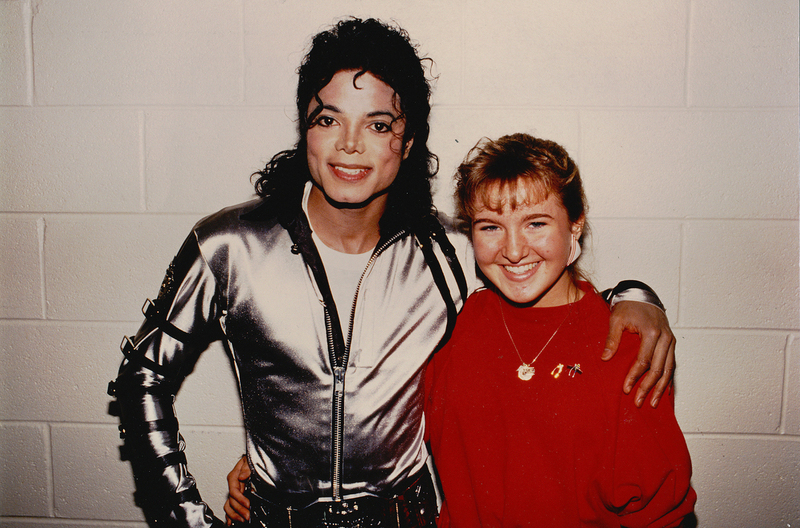 She danced on stage with Michael Jackson during his Bad concert tour. Tiffany Rowe, a 46-year-old life coach in the San Francisco Bay area, still remembers how it felt as a teenager to be hoisted onstage to dance with Michael Jackson during his Bad concert tour. She was 15 and recovering from an excruciating round of treatment for severe idiopathic aplastic anemia — basically total bone marrow failure. She had met Jackson in his greenroom before the concert, but she had been told that dancing with him — her real wish — wouldn't be possible. "I was in front of all of those people, and I could hear the roar, and I was calm," she recalls. "I was doing what I wished to do. I felt exactly the way I needed to feel, at home and confident in my body. There had been part of me that felt pretty betrayed by my body, and I felt very at peace in my own skin again." The moment was transformative for Rowe, who credits the experience with aiding her recovery. A study published in the journal Pediatric Research suggests her experience may not be unique. Researchers looked back at the cases of nearly 1,000 children with serious illnesses who were treated at Nationwide Children's Hospital in Columbus, Ohio. Half the children had received wishes and the other half hadn't. "My hypothesis is that these kids, when they come back, are more engaged with their families and medical providers, and perhaps they're more adherent to their treatment plan," says the study's lead author Dr. Anup D. Patel, section chief of neurology at Nationwide Children's Hospital and an associate professor of pediatrics at Ohio State University College of Medicine in Columbus. "What's harder to quantify is this feeling of hope and having a break from your illness," Patel says. "It gives them an ability to fight harder, and that's harder to measure." That ineffable feeling is what mattered for Rowe. Her illness had been caught late. She likely wouldn't have lived another month without treatment, she says. Even with treatment, her prognosis was three to six months. She lacked a perfect match for a bone marrow transplant, and she was so sick that her doctors didn't want to risk a potentially fatal transplant rejection. So she received a then-experimental therapy called antithymocyte globulin, today a common treatment for aplastic anemia. "I remember my mom saying, 'We don't know how this ends, but we have to try,' " Rowe says. She received her first treatment in the fall of 1984 and entered remission, but she relapsed in the fall of 1987. "For me, relapse had a deeper emotional toll. I understood what I was headed back into, the pain and uncertainty and fear," Rowe says. "I felt a bit demoralized, like I had failed. I didn't want to be sick anymore. I didn't want to have to survive anything." It was around then that a volunteer who had read about Rowe in the local paper visited her and offered a wish. Rowe didn't hesitate. "When everyone else wanted to be an astronaut, I wanted to be a dancer and dance with Michael Jackson," Rowe says. "When he moved, it just stopped time for me. As somebody who felt so passionately about dance myself and so elementally at home in my body while dancing, I just saw that in him and felt a kinship." Joining him onstage gave Rowe back ownership over her body — and her future. "There was a sense that I was fighting for something, not just against something, and that was incredibly motivating," she says. "I was surviving to go back and live a full and extraordinary life — not that I knew that would happen, but I could give myself permission to believe it was possible." To qualify for a wish, a child must have a life-threatening, but not necessarily terminal, condition, says Jamie Sandys, a spokesperson at Make-A-Wish Foundation. The foundation has more than 60 U.S.-based chapters and has granted more than 300,000 wishes since 1980. The organization granted approximately 15,400 wishes last year, Sandys says. Still, an estimated 27,000 children are diagnosed annually with an illness that qualifies them, which concerns Sandys. "There's a huge gap that we're trying to fill," Sandys says. Many past wish recipients have said the wish was an important part of their healing process. "These wishes can really be a springboard to help these children in overcoming their illnesses and producing better health outcomes for them," Sandys says. But verifying and quantifying those outcomes is difficult. It gives them an ability to fight harder, and that's harder to measure. "It's wonderful to have randomized controlled trials and measurable outcomes, but when you're looking at mind-body-spirit connection in medicine, we're not going to have the luxury of those outcomes," says Dr. James Fahner, a division chief for pediatric oncology at the Helen DeVos Children's Hospital in Grand Rapids, Mich. Though not involved in the study, Fahner is the immediate past chair of the Make-A-Wish America Medical Advisory Council. "I'm fundamentally a scientist, and I expect reasonable, reproducible metrics when I'm deciding on the validity of a particular cancer therapy, yet when I walk down the hall in that same clinic and see a child who has just returned from a wish, I see positive impacts like stronger adherence to therapy, family resiliency and hopefulness in the child," Fahner says. "The connection of mind-body-spirit can be hugely important, especially in a child going through such a rigorous and long therapy." A previous study tried to measure the effects of wish-granting and found less distress, fewer episodes of depression and reduced anxiety symptoms among children expecting a wish in the near future compared with those placed on a waiting list. This new study found more concrete differences, including cost savings. The average cost of a wish is $10,682, but multiple unplanned hospitalizations cost more. The study found that twice as many wish recipients had reduced health costs compared with people who didn't receive them. Patel was inspired to conduct this study after seeing changes in his own patients and before he joined the organization's medical advisory council. He had one 15-year-old boy with intractable seizures return from meeting the Los Angeles Clippers and never have a seizure again — a dramatic if rare and unlikely outcome. But Patel is also a scientist who believes in evidence. He knew his study would be scrutinized by others who doubted "that something as wishy-washy as a wish could make a difference." He chose to measure use of health care services because it is quantifiable in a way that "wellness" isn't. All the children were treated at the same hospital by the same medical teams, though it's unclear why some received a wish and some didn't. The researchers used medical records to identify 496 children who received a wish and compared them with 496 others with the same approximate age, gender, disease category and disease complexity. The distribution of private insurance, no insurance or Medicaid was also similar in both groups. Cancer was the most common illness — at 45 percent — among the children studied. After that, the most frequent conditions were blood-related/kidney (16.5 percent), neurological (14.5 percent) or genetic (14 percent). The breakdown is consistent with national figures: 45 percent of Make-A-Wish recipients have cancer and 13.5 percent have a nervous system disorder, Sandys says. The researchers found that wish recipients were 1.9 times more likely to have fewer emergency department visits and 2.5 times more likely to have fewer unplanned hospitalizations in the two years after their wish was granted, compared with matched children. The study is observational, so it can't show that receiving a wish caused better outcomes since other factors may have affected the results. But many health care providers see change in their patients after wishes are granted. "More positivity can sometimes be correlated with treatment adherence," says Ashley Andrews, a social worker at Children's Mercy Hospital in Kansas City, Mo. Andrews wasn't involved in the study but has connected children diagnosed with cystic fibrosis to Make-A-Wish. The excitement of a wish can change a family's and child's outlook enough that they may work harder with their medical providers, she says. "If their adherence has improved, obviously that would decrease the emergency department visits and hospitalizations." These kids still have a chronic illness and have to go through a lot ... "That's their reality, so I don't want people to think that just because these kids have Make-A-Wish that everything's fine. Ashley Andrews, a social worker at Children's Mercy Hospital in Kansas City, Mo. But it's also possible other factors affected emergency visits and hospitalizations in nonrecipients, such as the reasons some children didn't receive wishes. Perhaps they weren't well enough to travel and weren't interested in nontravel wishes. Perhaps parents turned down a wish if they felt another family deserved it more. Andrews also cautioned against too much optimism about the findings. "These kids still have a chronic illness and have to go through a lot of obstacles that you and I don't have to go through," Andrews says. "That's their reality, so I don't want people to think that just because these kids have Make-A-Wish that everything's fine." Dr. Arthur Lavin, chair of the American Academy of Pediatrics Committee on Psychosocial Aspects of Child and Family Health, says the findings make sense to him, too. But he also cautions that a child's worse health outcomes aren't a "failure" of the wish or of positive thinking. "We like to think you can only have improved health if you have an expensive medication, and those things can be critical to help, but being kind and caring to someone has an amazing impact on [their] health and well-being," Lavin says. But the measurement of the effect of kindness isn't entirely clear or predictable, he notes. Even if such effects aren't as quantifiable as other therapies, Patel sees their value in less quantifiable terms. "I recognize on a daily basis that I'm not going to help get seizures gone in a majority of cases with traditional interventions, so I'm always looking for ways to help families beyond treatment," Patel says. "Even if it's just making a kid happy for a couple of weeks, that's sometimes better than any medicine I can give them."